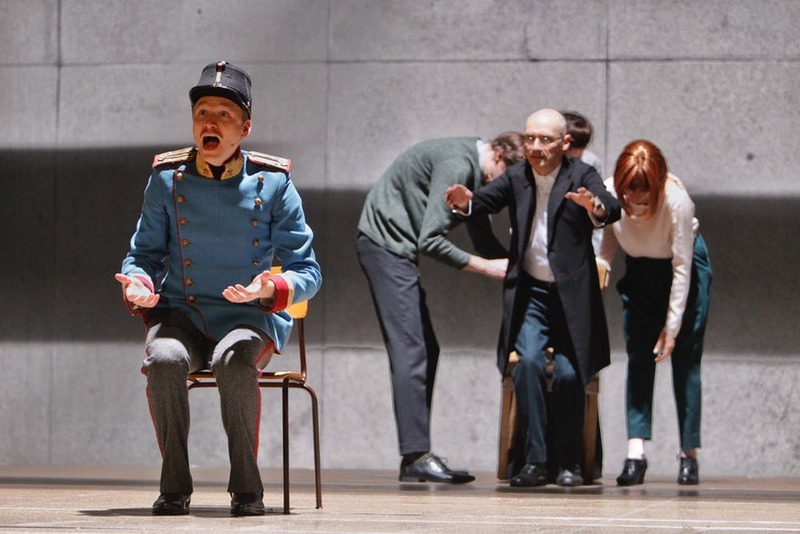 Schaubuhne Berlin (Germany) and Compicite (UK) present, BEWARE OF PITY, based on a novel by Stefan Zweig, in a version by Simon McBurney, James Yeatman, Mada Zade and the ensemble. In the Roslyn Packer Theatre, Hickson Rd, Walsh Bay. 23rd - 27th January. UNGEDULD DES HERZENS (THE HEART'S IMPATIENCE), the only novel by Stefan Zweig (1939) has been devised for performance, by two of the leading avant grade theatre explorers of Europe: Schaubuhne Berlin and Theatre Complicite of the UK, under the title, BEWARE OF PITY. It was first seen in Berlin in 2015, at the Barbican in 2017 and now, in Sydney, in 2019. Simon McBurney of Complicite, working with the Schaubuhne for the first time, has led a team of seven actors: Robert Beyer, Marie Burchard, Johannes Flaschberger, Christoph Gawenda, Moritz Gottwald, Laurenz Laufenberg and Eva Meckbach into deconstructing the novel with James Yeatman (Co-Director) and Maja Zade, and has with, especially, the Sound Design of Pete Malkin, and his sound associate, Benjamin Grant, found a form that takes us concentratedly into the world of Lieutenant Anton Hofmiller, a member of a cavalry unit of the Austrian-Hungarian army based in a locational fringe of that empire, months prior to the assassination of the Arch Duke Ferdinand and his wife in Sarajevo, that brought the world into a cataclysmic disaster of four years of destructive war. This production is performed in German and is accompanied by sur-titles in English. It is a two hour and fifteen minute journey without interval. The production is extremely faithful to the organising of the novel and has all seven actors on stage verbalising narrative as well as acting out scenes in character, both, with microphone assistance and deft physicalisation. The play has two actors engaged as our hero Hofmiller, Christoph Gawenda, as the 'framing' narrator remembering the story and Laurentz Laufenberg, as the enactor of the past events. Both are superb. All the other actors are excellent, shifting roles during the experience, aided by simple costume changes, Designed by Holly Waddington. It is on an open Set Design, by Anna Fleischle, that mainly is concerned with the pragmatics of the performance style rather than any period detail - a glass cabinet that moves on wheels in many imaginative transformations, a gurney-like table, also mobile, tables/desks with microphones on stands, chairs, music stands with copies of the script lit sensitively in an important and intricate atmospheric Lighting Design by Paul Anderson. The depth for the opportunistic imaginative immersion for the audience to create the actual world in the play's historic context, both, figuratively and emotionally, is in an intricately and versatile, brilliant use of Video Design by Will Duke. Hofmiller, a young cavalry soldier from a family of no caste, is drawn into the circle of the only Family of significance in his Unit's placement, the Kekesfalva's. At a dinner to which Hofmiller is invited he makes a social faux pas when he asks one of the daughters of the house, Edith, to dance, There is an immense tension when he finds that he has asked a young cripple to do so. In abject embarrassment he attempts to apologise and sends her flowers the following day. Edith is impressed and invites him back to the castle and there begins a relationship of subtle affection and compassion - one that may be driven by pity for her on his part. Unfortunately, Edith develops a love passion, and Hofmiller under pressure from her family, becomes engaged to her as an encouragement for her to take a treatment for her affliction. She believing in him becomes more enmeshed in her feelings for him. He has come to find her touch repulsive. Publicly, within the unit and town, fearing ridicule and contempt, he denies his engagement. Hearing of this Edith, fluxes in the heated temper of the enraged ill, despairs and, through an incident of history - the Declaration of War, does not receive a re-assuring telegram from him, and ultimately, suicides. Hofmiller is wracked by guilt - Beware of Pity. The sur-titles, placed at the back of the action, on the sides, are the security (the life line for us non-German speakers) of the performance, and the exercise of the experience is the necessity to read to give clarity to the action of the play. There is a very dense and detailed sur-titled element. It is rather like reading the novel in an intensified version accompanied, peripherally, by live and video action. Strangely, one becomes able - adept - to the reading and the watching, and both coalesced into a seamless concentration. The length of the uninterrupted performance was not a chore and I was surprised at my lack of time memory. The play is an old-fashioned melodrama of the 1930's-40's style, made 'superior' and given depth with a moral 'struggle' and lesson. The production by Mr McBurney and this very assured company of collaborators, on the other hand, is stylistically contemporary and crisp in its highly efficient action/Directorial conceits. It is delivered with great confidence and and reveals an exemplary ensemble full of artistic cohesion and trust. It is cool and clean. It is immersively clear. It has a kind of demanding arrogance -'catch us if you can/will' - and has a rewarding pay-off if you buckle under, read the sur-titles, and go with it. BEWARE OF PITY, a two hour traffic on the stage, that is absorbing. Mr McBurney, who usually delivers his works with a dense focus of technical innovation and contemporary tools, has weighted this production with the words from the novel, and simplifying his methods, encouraged true and thrilling performances from his actors. This is a production of the highest quality. I had a different experience to yours. I was in the first row centre of the Dress Circle and maybe this affected my experience. I found I was distanced from the action by the necessity to read the surtitles. My gaze kept on flicking between the two and the action. I couldn't find a rhythm. Even so I found the performance quite a staid one - a lot of 'talking heads'. The action and staging was not astonishing or awe-inspiring. In contrast, I think back to A Disappearing Number and Schaubuhne's Hamlet, both, in their own ways, iconic examples of theatre's ability to be a revelation for an audience. Simon McBurney is currently very engaged in exploring the use of voice amplification in theatre. It hasn't worked for me on the last two occasions I've seen a Complicite production.